New Delhi, April 3: With Royal Challengers Bangalore losing their fourth successive game in this edition of the Indian Premier League, questions have been raised on skipper Virat Kohli and his tactical acumen by pundits. Interestingly, Kohli has lost the last seven games that he has captained in -- three ODIs against Australia and four T20s in the IPL. What makes matters worse is that he has not had former skipper M.S. Dhoni by his side in six of those seven. While Dhoni sat out the last two ODIs against Australia, he has been leading Chennai Super Kings in the IPL. In stark contrast to Kohli's fate, Dhoni and team have won all their games in the championship so far and are sitting at the top of the points table. 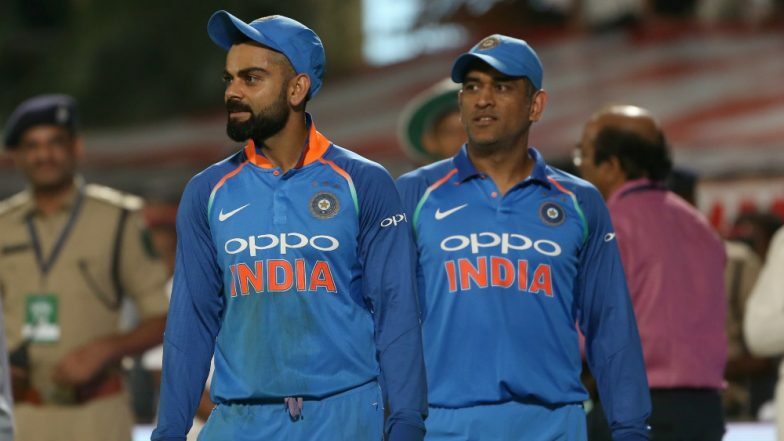 Even more interestingly, Dhoni showed his tactical superiority when he went into the opening game of the IPL with three spinners as Kohli misread conditions and played just one regular spinner in Yuzvendra Chahal. CSK won by 7 wickets. Speaking to IANS, sources in the Indian team management said it is a simple case of Kohli being able to express himself better when he has Dhoni around him. "Let us not read too much into T20 games, but the thing is that when you have someone like Dhoni around, you can be yourself. Dhoni helps Kohli make decisions and also guides the bowlers like you would have seen time and again. "Youngsters like Kuldeep Yadav and Yuzvendra Chahal feel at home when they have Dhoni guiding them from behind the wicket. That is why Dhoni is such an integral member of the Indian ODI set-up. "Kohli can also focus on his batting when Dhoni is around. See his scores in the last seven games that you are mentioning. Dhoni was there is Ranchi and Kohli scored 123. After that, the scores read 7, 20, 6, 46, 3 and 23. It always helps when you have a senior member in the team to guide you with his experience," the source said. While Kohli's recent run in the IPL has once again started the debate on his skills as captain, CSK all-rounder Dwayne Bravo after their second game against Delhi Capitals said he just followed the instructions of skipper Dhoni and that helped. Also when it comes to taking the game deep and finishing things, MSD showcased the skills during the game against Rajasthan Royals. On a difficult wicket, Dhoni hit an unbeaten 75 to take a struggling CSK to 175/5 in their 20 overs -- a total that ended up being too good for RR. Commenting on Dhoni's role not just in the CSK unit, but also the Indian team, a BCCI official said: "He is the balancing factor in the Indian team. Cricket in India evokes a range of emotions with every fan having his/her favourite player. "Kohli is arguably the best batsman in the world, but cricket isn't an individual game and the atmosphere in the dressing room and the team spirit play a huge part in the success of the team. "Dhoni at this moment is integral to the success of the team ever since he took up the role of the senior and guiding player in the team. His presence has a calming effect on the entire team. "For India to succeed in the World Cup, Dhoni's presence is very important. He is most adept at reading the game, changing the pace of the game as per requirements and his guidance from behind the stumps gives bowlers immense confidence. This is visible with CSK as well, because their bowling is average at best, but as skipper, Dhoni, has brought out the best from them. "Although cricket is a funny game and now that I mention it, I hope I haven't jinxed him," the official said.